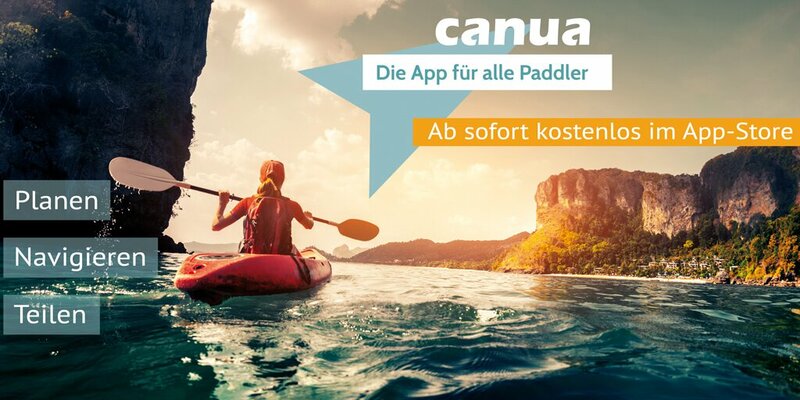 The official paddle app of the joint venture between TouchingCode GmbH and the German Canoeing Association. "I am delighted that with canua we are now able to offer a comprehensive digital offer for all paddlers. I am sure that many canoeists will use this great offer." DKV President Thomas Konietzko at the presentation of the App. With canua canoe tours can be planned, recorded and shared. The app provides all relevant information for every German canoe. The paddling areas can be easily searched. The OpenStreetMap map, which has been optimised for water bodies and supplied by the company's own map server, lists and illustrates favourable entry and exit points, weirs and danger spots, as well as resting and overnight accommodation options. In addition, paddlers receive information about water character, gradients, difficulties, obstacles, sights, campsites and boathouses. Everything you need to know to plan your trip, such as how to get to the campsite with public means of transport and any restrictions on travel, is included. With it canua brings the DKV water guides for Germany and paddling areas of the neighbouring countries Holland, France, Poland, the Czech Republic and Northern Italy to mobile phones. The app is free of charge. In addition, route suggestions can be purchased for many waters. The app is a joint venture between DKV-GmbH and TouchingCode Software GmbH from Berlin. The app contains interfaces to the DKV water database and the DKV electronic logbook (eFB). For the app, the volunteer water editors have provided all contained waters with geocoordinates and routes. At the start of the app, the database contained 2,200 rivers with 75,000 objects.